In 2010 Justin Comparetto and his grandpa Joe loaded up their vehicle with imported olives and imported oils and began going to markets and green grocers in South Florida. Joe was retired from real estate and enjoyed mentoring Justin in business relations. Joe had a friend who ran an importing business and had been trying to convince him to help him import products. This was the perfect opportunity. Ryan Braun Justin's cousin was later brought into the new business. Specializing in imported Italian products they began with twelve items. They now offer over 2,000. AS their company grew from South Florida to Miami and beyond they became Just Ryt Foods Inc. 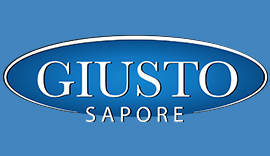 In 2014 they launched their own brand label named Giusto Sapore. Giusto Sapore is Italian for "Just the right flavor"! Joe sadly passed on. But the company him and his grandson started lives on. Now Giusto Sapore can be found in large scale supermarkets like Harris Tetter. We were able to try many Giusto Sapore vinegars. Giusto Sapore Apple, Fig, Strawberry and Mango Sweet Fruit Vinegar's are a lightly fruity vinegar. I use them in many of my favorite recipe's they are so versatile. My lifestyle is all about healthy natural choices. My mother and sister began a lifestyle change beginning with healthy food choices. I first said "You two go ahead and eat your organic stuff, I am going to eat my great pizza", and I did. I then watched the healthy food exchange's that they made and how good their food looked. I gave it a try and now I am an avid addict of healthy eating. Apples and peanut butter have replaced candy bars and water has replaced soda for my family. I really did not understand how important my food choices were in the health of my children. I now realize that I want to make conscious food choices. Guisto Sapore vinegar's are a natural diuretic that aids in weight loss, helps detoxify your body giving it that slightly acidic PH Balance to decrease many unhealthy bacteria that our bodies grow. Try a cup in the morning with 1 tablespoon Giusto Sapore vinegar and the same in the evening, you will be surprised at the taste and the health benefits you will receive. My favorite recipe is above! You will never know you are eating healthy! Awesome thanks for the giveaway!